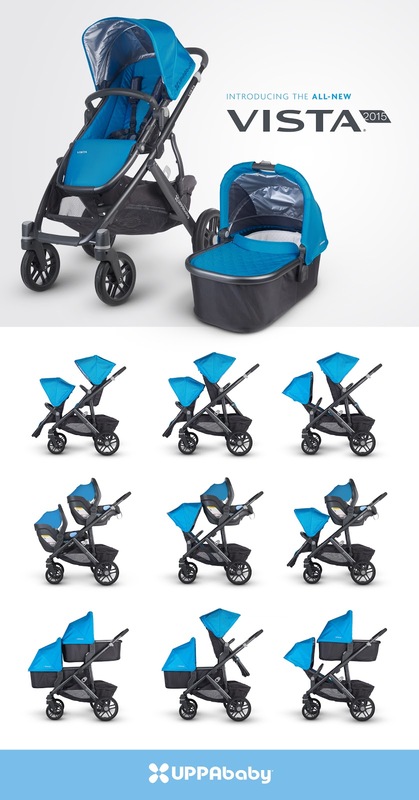 The new upgraded version of UPPAbaby Vista 2015 is a magnificent stroller with loads of configuration options. The new Vista can now take two car seats, two bassinets, and two toddler seats facing in either direction. It now has a one-step fold, similar to that of the Cruz. The frame is made of a lightweight yet sturdy aluminum and magnesium combinations, and features new never flat wheels with AirGo technology that mimic the cushioned ride of an air-filled tire with the lightweight benefit of foam. The Rumbleseat has been significantly improved for 2015, with the ability to recline and face in either direction. The bumper bar is now one piece, making it easier to clean. Bassinets now come with a zip out liner and boot cover and are compatible with 2015 Cruz stroller and new Legacy stroller as well. Not surprisingly, all this goodness comes with a pretty hefty price tag of $819.99 – $859.99. The new Vista 2015 should be available for purchase in October 2014.